Home » World News » Israel postpones approval of new settlement construction amid spat with U.S.
Israel postpones approval of new settlement construction amid spat with U.S.
Israeli Prime Minister Benjamin Netanyahu instructed the Jerusalem municipality on Wednesday to wait on approving new housing units in a bid to avoid further strain in U.S.-Israeli relations, a local official said. Jerusalem’s Municipal Planning and Construction Committee had been scheduled to finalize construction plans for some 492 new homes in Jewish neighborhoods in East Jerusalem, despite a resolution approved Friday by the United Nations Security Council that views the settlements in the West Bank and East Jerusalem as having “no legal validity” and as a barrier to achieving peace with the Palestinians. The resolution, which was approved by 14 votes to 0, passed because the United States, in a break with long-standing policy, decided to abstain instead of using its veto power. The latest move is a surprising turnabout by Netanyahu after days of attacks against President Obama and his advisers, who were accused of failing to protect Israel and “colluding” with the Palestinians to draft the resolution and push it to a vote. It also came hours before Secretary of State John F. Kerry was scheduled to give a speech Wednesday ­morning outlining his vision for resolving the conflict between the ­Israelis and Palestinians. “Our goal is to provide solutions to residents of Jerusalem. We have a problem building in central Jerusalem, and this is a natural expansion for the city,” he said. The 492 housing units are part of a wider plan to build in Jewish settlements in East Jerusalem, an area the Palestinians would like to see as their capital of a future state. On Tuesday, the Israeli government appeared to be stepping up its battle with the Obama administration, saying it had solid proof that the United States orchestrated the resolution. State Department deputy spokesman Mark Toner denied that the administration had “precooked” the resolution. But the U.S. explanation did little to quell fears in Israel that another Security Council censure may be forthcoming, even though U.S. officials insisted that no more U.N. resolutions are expected. On Wednesday, an Egyptian website El-Youm el-Sabaa said it had a copy of minutes from a meeting held between senior U.S. officials and a Palestinian delegation 10 days before vote. According to those protocols, the United States allegedly said it was willing to withhold its veto power if the resolution was balanced. The position was purportedly stated in a meeting attended by Kerry, national security adviser Susan E. Rice, Palestine Liberation Organization Chairman Saeb Erekat and Majid Faraj, commander of the Palestinian General Intelligence Service. “There is no truth to the notion that we discussed the text of any resolution or that we previewed any position we might take on a hypothetical resolution in those meetings,” said a senior State Department official, speaking on the condition of anonymity to comment on private deliberations. Meanwhile, new details started to emerge about the behind-the-scenes diplomatic scramble that preceded the resolution, which declared that Israel’s settlements in the West Bank and East Jerusalem have “no legal validity” and are a “flagrant violation under international law.” It called the settlements an obstacle to achieving a two-state solution and peace with the Palestinians. A diplomat from a Security Council nation, speaking on the condition of anonymity, largely backed up the Obama administration’s account that it played no role in bringing the resolution to a vote. It had been discussed among Security Council members for months, and the U.S. position was well known. The United States never told anyone how it would vote, not even in a consultation room where the 15 members of the Security Council gathered before they filed in to vote, according to the diplomat. The U.S. officials in attendance said they were still in “consultations” over the resolution, the diplomat said. Haaretz said Netanyahu vowed to recall Israel’s ambassador to New Zealand but that McCully rebuffed the threat. The report said that after Egypt backed down, diplomats from the Palestinian Authority and Arab Persian Gulf states urged the four co-sponsoring nations to move on with the resolution anyway. The message was driven home by Britain, which had worked directly with the Palestinians on drafting the language. A last-minute glitch came up when Russia’s ambassador to the United Nations, Vitaly Churkin, proposed postponing the vote until after Christmas, according to an interview the deputy Russian ambassador to Israel gave on Israel Army Radio. This reportedly followed a phone call between Netanyahu and Russian President Vladi­mir Putin. The other Security Council ambassadors refused to wait, however. Israel stepped back from approving hundreds of new homes in East Jerusalem on Wednesday, ahead of a speech by US Secretary of State John Kerry on the Obama administration's vision for Middle East peace. 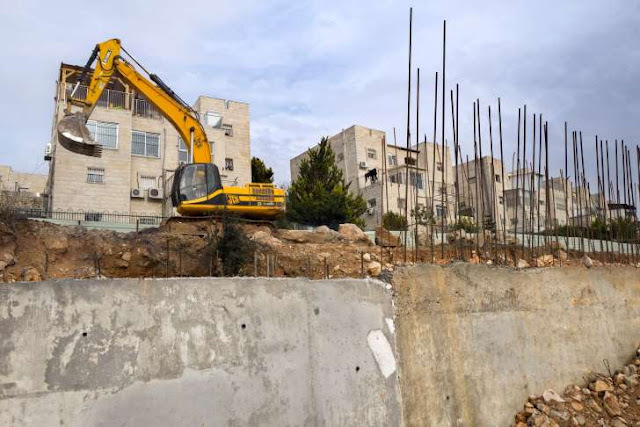 The city council in Jerusalem canceled a vote to approve the construction of 492 units -- such as homes, synagogues and other public buildings -- in areas of East Jerusalem annexed by Israel. Council member Hanan Rubin, a member of the city's zoning committee, said the decision followed a request from Israeli Prime Minister Benjamin Netanyahu. It came days after the United Nations Security Council passed a resolution condemning Israel's settlements in the occupied West Bank and East Jerusalem and as Kerry prepared to give his speech on Wednesday. "The municipality regards housing in Jerusalem as a municipal need rather than a political action, and therefore there is no need to vote on this on a sensitive day when John Kerry is to give a speech," Rubin said. "We don't want to be a part of a political controversy." The reason behind Netanyahu's call for the city council's vote to be canceled remains unclear, and the vote could still come before the city council's zoning committee in the future. • Settlements in the West Bank and East Jerusalem are built on land seized by Israel during the 1967 Arab-Israeli Six-Day War. • Many in the international community believe that such settlements are illegal and a barrier to any future "two-state" peace deal. Palestinians claim East Jerusalem as the capital of their future state. • The UN Security Council resolution states that Israel's settlement program has "no legal validity and constitutes a flagrant violation under international law." Israel disputes this. • A "two-state solution" envisages a Palestinian state existing alongside Israel, based on territory in Gaza, the West Bank and East Jerusalem -- but Israel's continued building threatens its viability. • Settlements are controversial within Israel too. While they are widely supported by right-wing and ultra-Orthodox groups, other Israelis see them as an obstacle to peace. Friday's Security Council resolution passed after the US, which usually vetoes such resolutions, decided to abstain. In response, Netanyahu summoned the US ambassador to Israel on Sunday. On Monday he ordered the Israeli Foreign Ministry temporarily to limit all working ties with the embassies of the 12 UN Security Council members who voted in favor of the resolution. On Wednesday, the mayor of an Israeli settlement in the West Bank, Oded Revivi, sharply criticized Kerry, who leads US policy on Israel. US President-elect Donald Trump pledged US policy on Israel would change once he was inaugurated. "We cannot continue to let Israel be treated with such total disdain and disrespect. They used to have a great friend in the US, but not anymore," he said on Twitter. It emerged on Wednesday that Netanyahu threatened a diplomatic "declaration of war" against New Zealand if it supported the resolution. Netanyahu made the threat to New Zealand's Foreign Minister Murray McCully hours before the vote last Friday, according to an according official with knowledge of the conversation, who asked not to be identified because of diplomatic sensitivities. New Zealand was one of four countries which introduced the resolution. Netanyahu instructed the Israeli Ambassador to New Zealand to return to Israel for consultations after the vote. While the resolution passed Friday is non-binding, Israel is concerned that there may be follow-up action at the United Nations -- specifically, a resolution that would set conditions for negotiations. Such a resolution would issue parameters for some of the most sensitive issues in the Israeli-Palestinian conflict, including borders, the status of Jerusalem as a contested capital, Palestinian refugees, and a time limit for negotiations. The international peace conference scheduled for January 15 in Paris could be the forum for discussing such a resolution. That would give the international community time to introduce the resolution at the UN Security Council before the end of Obama's time in office. Israel has vowed not to attend the conference. The Palestinians say they will attend. Settlement building in the occupied West Bank is considered illegal under international law, although Israel disputes this. The United States considers settlements "illegitimate" and "an obstacle to peace." Secretary of State John Kerry on Wednesday defended the controversial decision to abstain on a U.N. vote condemning Israeli settlements, saying the Obama administration wants to push a two-state solution for peace with Palestinians. "That is what we are trying to preserve for our sake and (Israel's)," Kerry said. "We reject the criticism that this vote abandons Israel." In a lengthy explanation of his vision for peace in the Middle East, Kerry assailed Israeli settlements on land claimed by Palestinians for an independent state as an obstacle to peace. Kerry said the settlements put prospects for peace in "jeopardy." Kerry said a two-state solution, which calls for an independent Palestinian state existing peacefully alongside Israel, is the only way to guarantee the Jewish state's long-term security in the region. “If the choice is one state, Israel can either be Jewish or democratic, it cannot be both," Kerry said. Israeli Prime Minister Benjamin Netanyahu, who had condemned the United States for abstaining in Friday's Security Council vote, lashed out at Kerry's speech as "almost as unbalanced as the anti-Israel resolution passed at the U.N. last week." "Israelis do not need to be lectured about the importance of peace by foreign leaders," he said. The sharp exchange represents another flare-up in the Obama administration's relationship with Israel. Netanyahu was a leading critic of last year's nuclear arms deal with Iran. President-elect Donald Trump, another critic of the nuclear deal, wanted the United States to veto the United Nations resolution and attacked it after it passed. Before Kerry's speech Wednesday, Trump tweeted, "We cannot continue to let Israel be treated with such total disdain and disrespect. They used to have a great friend in the U.S., but not anymore. The beginning of the end was the horrible Iran deal, and now this (U.N.)! Stay strong Israel, January 20th is fast approaching!" Trump will be inaugurated as president Jan. 20. The city of Jerusalem had planned to approve permits Wednesday for the construction of hundreds of homes for Israelis in East Jerusalem, but it postponed a vote, so Kerry could give his speech outlining the Obama administration's vision for peace. The committee could approve the construction permits at a later date. About 600,000 Israeli settlers live on land in the West Bank and East Jerusalem that both Israel and Palestinians claim rights to. In addition to condemning Israeli settlements as a “flagrant violation” of international law, the U.N. resolution condemned Palestinian attacks on Israelis. Palestinian Authority President Mahmoud Abbas said Wednesday that he is ready to resume peace talks with Israel if it halts settlement construction. Prospects for resuming long-dormant negotiations soon seem highly unlikely as long as Israel's government supports expanded settlements and Palestinians persist in attacking Israelis with knives and other weapons. The secretary, whose four-year tenure ends next month, revived his six-point plan for a peace agreement. That includes negotiated borders for Israel and a Palestinian state, formal recognition of each other's sovereignty and access to holy sites in Jerusalem. The Palestinians want East Jerusalem to be their capital, but Israel has ruled out dividing the city that serves as its capital. 0 Response to "Israel postpones approval of new settlement construction amid spat with U.S."